I am writing to you to ask for your help. Yesterday, in a split second, we lost our dog. One second he was there, the next he was gone. We were walking just near our house, an area he knows very well. As we live in the middle of the country side, he is used to run around freely with his sister Trisha when we go out for hikes. But yesterday he just never came back home with us. We have no clue what could have happened to him. 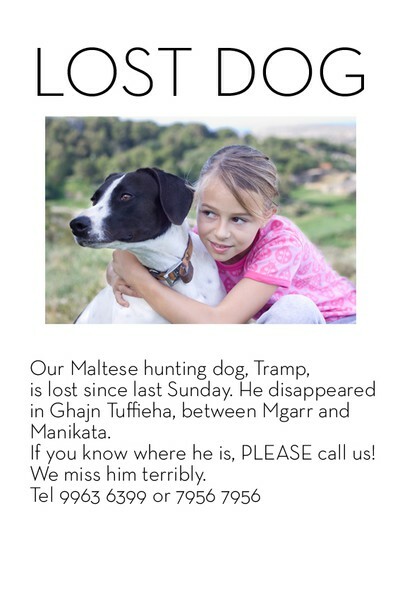 PLEASE PLEASE if you live in Malta: forward this blogpost to anyone you know and maybe we might just find out what has happened to Tramp. We miss him beyond what any words can describe, and just want him to come home to us again.